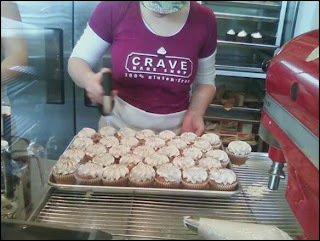 On December 18, 2011, Crave Bake Shop fans were given a lovely Christmas present: pastry chef Kyra Bussanich and assistant Jackie Eizik were on another episode of "Cupcake Wars." The winner of that episode (taped in November) would have his/her cupcakes at a casting party, celebrating the 100th episode of "The Closer." After three rounds of stressful baking, Kyra and Jackie emerged victorious. Kyra was the first gluten-free winner on "Cupcake Wars," as well as the first winner from the Pacific Northwest. Another gift for Crave Bake Shop customers followed: Kyra and her staff featured each of the four winning cupcakes from the show -- one each week for four weeks. Each special cupcake was $4. What does this mean? I had to try them, of course! First up (week of 12/20 to 12/23) was the "Coffee and Doughnuts" cupcake: a cupcake with a hint of nutmeg, topped with espresso buttercream, a mini glazed old-fashioned doughnut, and some chocolate sprinkles. 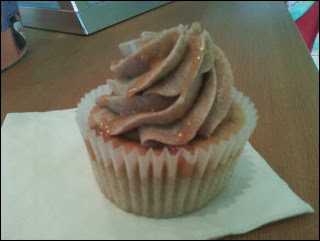 As usual, another great cupcake, light and relatively moist. 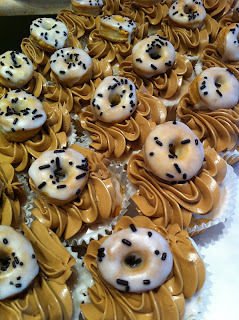 I really liked the mini glazed doughnut on top both for visual appeal and taste. The glaze hardened around the soft doughnut, creating that awesome texture contrast. 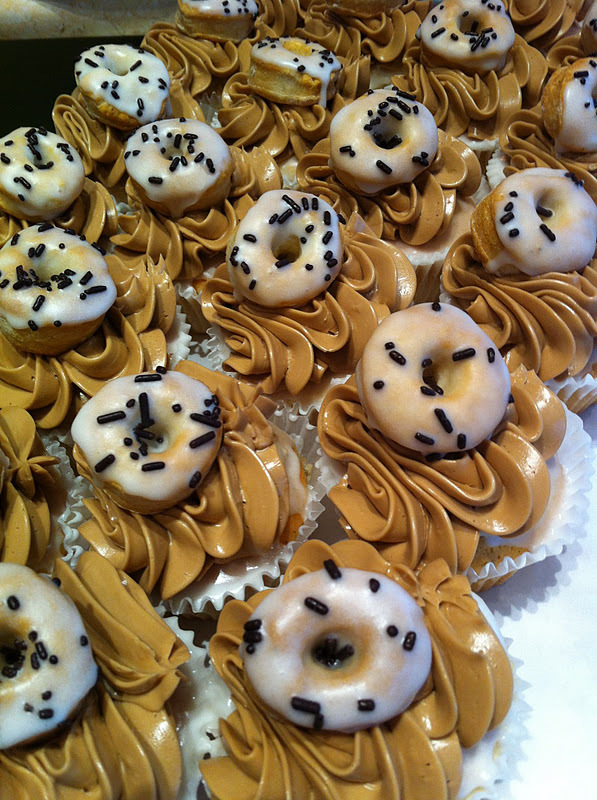 The espresso buttercream melted in my mouth and had noticeable coffee tones without overpowering everything else. Special cupcake the week of 12/20 to 12/23! 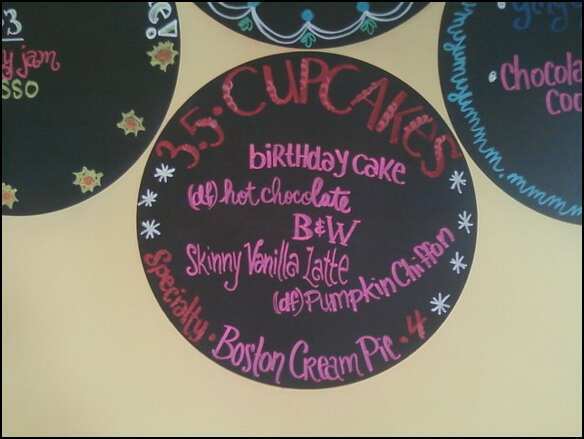 Here is a MUCH better photo, courtesy of the people at Crave Bake Shop! 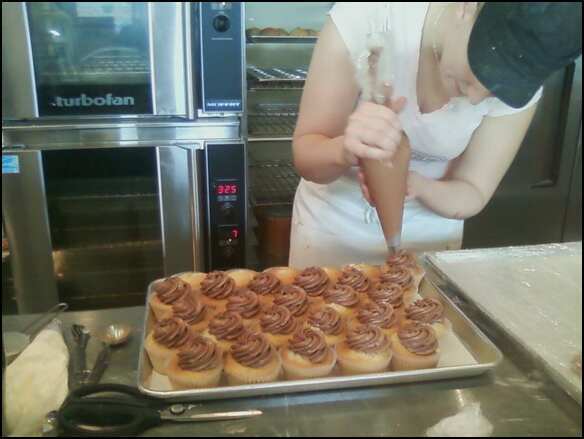 You can find this amazing photo on Crave Bake Shop's Facebook page! Second (week of 12/27 to 12/31) was the Apple Fritter cupcake: a cinnamon cupcake with salted caramel and apple compote filling, topped with cinnamon Italian meringue buttercream and salted caramel drizzle. This was Kyra's personal favorite -- and it was also my favorite overall. The compote screamed "apple pie" all the way. Since apple pie is one of my all-time favorites, there was really no way to go wrong here. The apples were cooked perfectly for that great texture contrast against the cupcake. The cinnamon in the cupcake and in the buttercream did not overpower the other components. An outstanding job! Week of 12/26 to 12/31! Apple Fritter cupcake! Oops...forgot to take a photo of the filling! 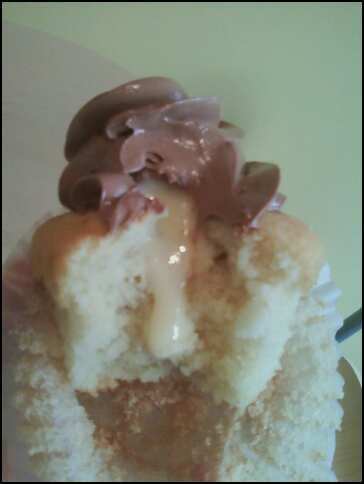 Third (week of 1/3 to 1/7) was the Boston Cream pie cupcake. A vanilla cupcake filled with vanilla pastry cream and topped with dark chocolate Italian meringue buttercream. The "Cupcake Wars" judges had extremely high praise for this one. Just the silkiest, lightest chocolate meringue buttercream I've ever had. The cupcake itself was light, and the vanilla pastry cream filling was basically...how should I put this: the bomb-diggity. Sounds good to me. Again, I like the fritter one just a little bit more, but my bias on apple fritters and apple pies makes it an unfair fight. 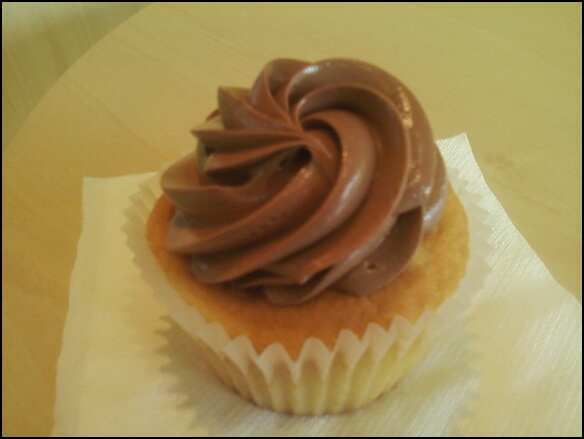 The Boston Cream Pie cupcake was amazing, 'nuff said. I took my friend here on the last day they sold this cupcake. She was completely blown away and couldn't stop talking about it for hours -- assuming she could even muster the words to speak. And she forgot that this was a gluten-free cupcake. That's one powerful delicacy! 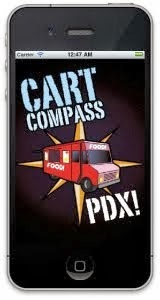 Foodgasms unite! 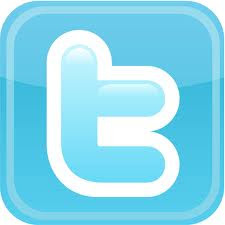 Week of 1/3/12 to 1/7/12! Just had to get this shot in of an employee torching some meringue! These are Dairy-Free Pumpkin Spice cupcakes! 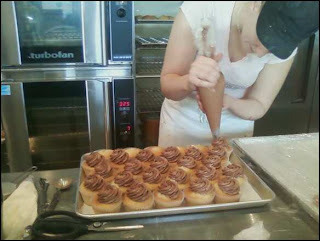 Jackie frosts the Boston Cream Pie cupcake! 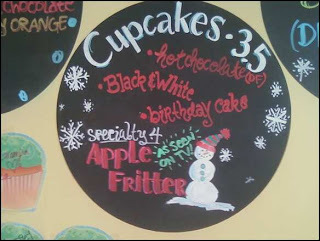 The final week (1/10 to 1/14) of cupcake specials featured the "Ding Dong" cupcake. A chocolate cupcake with marshmallow meringue filling and topped with a dark chocolate glaze. This cupcake was a major hit at "The Closer" casting party. The dark chocolate glaze cooled on the racks, creating this lovely shell to contrast with the fluffy cupcake. The filling retained some structure, yet was light on my stomach. A shot of the filling! 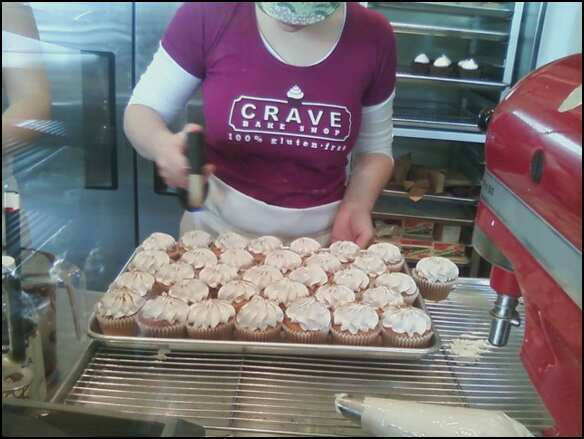 Again, if you haven't checked out Crave Bake Shop in Lake Oswego, Oregon, go pronto! I can't praise this place highly enough. These are dangerously awesome cupcakes, guys. Basically Chuck Norris lethal (I'm glad cupcakes don't have legs to kick me to the next galaxy). I coulda easily eaten a box of these myself, call it a sugary cheat meal, and die a happy man. With the number of goodies I've had from this place, it's amazing I haven't gotten fat or diabetic by now. 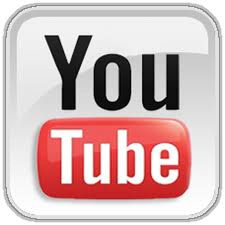 As an aside, in mid-October 2011, Kyra had a guest post on "The Sugar Cove" blog. It's an amazing, uplifting read. I can virtually assure you that I won't find a better bake shop around. This is a Cupcake Wars-winning bake shop for a reason. After an insane number of visits, with outstanding results each time, I can finally put Crave Bake Shop at the top of my list. It's as close to perfection as I may get. And that's perfectly fine with me. Wow! 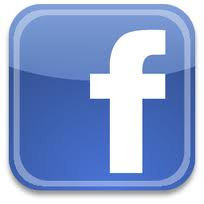 Because on your post I was thinking now to have a bake shop business those cupcakes looks really delicious.